Just like with the London 7/7 Bombings which coincided perfectly with the G8 Summit in Gleneagles, Scotland, last week’s Paris Attacks were timed with the G20 Summit in Istanbul – elevating the ‘War on Terror’ (now rebranded to the ‘War on ISIS’) to the top of the west’s international and military agenda. Once again, job done. Now France is locked down in a state of emergency, effectively under Martial Law. Immediately after the Paris Attacks on Friday Nov. 13th, French authorities and mainstream media wasted no time in expediting the crucial talking point that a Syrian passport was found either on, or near, the body of one of the alleged suicide bombers outside the Stade de France sporting arena in Paris. This begged the obvious question: why would supposed suicide bombers all pack their passports with them on a one-way jihad? Public suspicion immediate went viral on social media, as people pointed out how this anomaly directly mirrored similar false flag stunts on 9/11 in 2001, with MH17 in 2014, and with Charlie Hebdo last January. This seemed to force the mainstream media to pivot, as they ‘walked back’ the Syrian passport leg of their story and take rear guard action before the public copped on to what was likely a planted set-piece at the scene of the crime. At this point, the mainstream choir suddenly U-turned and claimed in unison, that the Syrian passport was indeed a ‘fake’ – but even then, the mainstream media still stood by the assertion that the alleged suicide bomber had sneaked into Europe from Syria undercover the west’s cleverly engineered ‘Migrant Crisis’ in Europe. 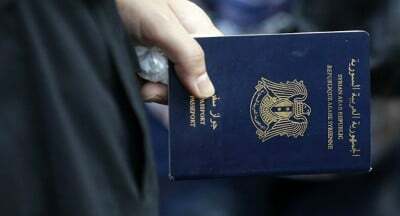 If the passport(s) is indeed fake, then how could police be certain that the passport’s carrier was the same as the passport’s legitimate owner? How can they be sure the ‘fake’ passports were not planted at the scene, or did not belong to someone else, a bystander for example? Could the crime scene have been tampered with before or after the event? Interesting questions, and ones which have already netted a number of creative and improbable theories by authorities and their media operatives. Most importantly, the lack of real evidence in this case pretty much destroys the fabricated talking point which fuses together this ‘ISIS terrorist’ event together with the ‘Migrant Crisis’. If we are to truly believe authorities again, then maybe we are underestimating the true value of these indestructible travel documents. We could be missing out on one of mankind’s greatest, most strongest ever material designs.